As a philospher, I do believe that in my 29 years of existence and pursuit of thirst and happiness, there never was a thirst that Coca could couldn't satisfy. Just drink a bottle of Sakto if you'd like to know why. Surely, just a bottle or two will tell you. 1) The Coca-Cola “Any Concert Anywhere” Blogger Contest will run from February 18 to March 15, 2011.
d. The Coca-Cola Export Corporation (Philippines) and its agency reserves the right to decline any registration for any reason, if the need arises, such as but not limited to any misrepresentation of or inconsistencies with the Coca-Cola Brand Values. b. 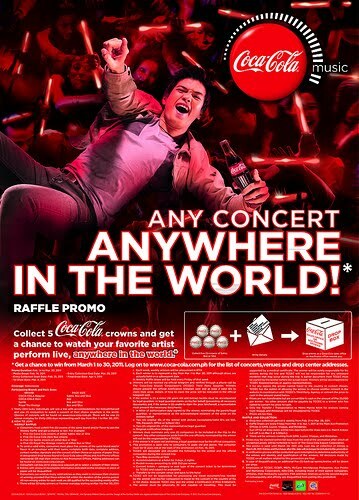 Your content must be clear in its objective: Invite and Encourage Teens to Join the Coca-Cola “Any Concert Anywhere” Raffle Promotion. b. Winning blogger has the option to choose which winner to accompany. The winning blogger then gets to join the official promo winner in the promo winner’s chosen concert. Blogger prize will not be convertible to cash. d. The winning blogger shall be responsible for obtaining and processing his/her own passport, visa for travel, and any travel document required to venue of the concert to be attended by his/her chosen promo winner. And if you are artistic or creative like that, let your creative juices flow and join the Coke Dream Pack Contest and get the chance to win an iTouch! CLICK HERE for details!